The 2007 DCI World Championships went to California for the first time in history, moving into the venerable Rose Bowl Stadium. Top among the corps that didn't make it into the Finals competition was the Academy, in its first year as a World Class group. The corps placed 13th in Semifinals to slip out of the last available spot in Finals, falling to Spirit from JSU. Back at the DCI Southwestern Championship, Academy had finished in 10th in the evening show, while Spirit was four positions down in the morning qualification round, two positions out of being able to advance to the big show later that day. Blue Stars finished the season just 0.15 under the Academy, taking 14th place for the second year in a row, two years removed from competing in Division II, four years from being in Division III, and just one year away from popping into 8th place for three consecutive years. Madison Scouts had—for them—an off-season, finishing 15th. 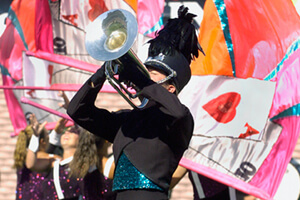 However, earlier in the season, the corps had lost to five corps it was to outscore in Quarterfinals, including Crossmen, Pacific Crest, Cascades, Southwind and Troopers. Pacific Crest finished 17th with "What Happens in Vegas…" The title was inspired by the nationally-broadcast television commercials that stated, "What happens in Vegas…stays in Vegas," encouraging people to let down their hair and release their inhibitions and do things they wouldn't normally do back home. There was a storyline under the surface of the production, utilized by the staff prior to the season to chart out the flow of the show. It was about a young man drawn to the allure of the town, arriving with big dreams and little change. Amidst the dancing showgirls and thousands of untold gamblers, he pushed through 24 sleepless hours to make a fortune and find love in a smoke-filled casino. It's possible that many weren't even aware of this, but the show was plenty entertaining even without realizing that. A member of front ensemble was seen cutting a deck of cards before the start of show as the corps was introduced. From the opening brassy fanfare onward, it was clear this was going to be a show highlighting the glitz and glamour of Vegas, playing off the seemingly infinite island of neon riding the crest of the sunbaked desert. A "7777" drill formation in the opener of "Viva Las Vegas" anticipated the good luck to come. The tune came from the 1964 romantic musical film hit of the same name starring Elvis Presley and Ann-Margaret. While Presley sang the Doc Pomus/Mort Shuman hit in the film, he never was to perform it live on stage. While the song is widely recognized today, it appeared on the B-side of the record single released at the time of the film, taking a back seat to Presley's rendition of Ray Charles' "What'd I Say." Cole Porter wrote "Love for Sale" for the 1930 Broadway musical, "The New Yorkers." While the song has been covered by a multitude of vocalists over the decades, it was originally banned from radio airplay due to what was considered at the time to be scandalous references sung from the viewpoint of a prostitute. The corps' version wasn't the standard laidback ballad one typically hears, but instead kept up the intense punch of the opener, even including a "shout-out" chorus from the brass section. At then end, reality intruded upon the hopes and dreams when a live announcer proclaimed, "In Vegas, money talks. It says 'good-bye.'" The lyrical downtime in the show began with a set of large dice being tossed off the field at the beginning of "Angel Eyes," a jazz standard written by singer and bandleader Matt Dennis for the 1953 film, "Jennifer," starring Ida Lupino and Howard Duff. It's a melancholy song about missing one's love and being aware that others around them are happy and they're not. Frank Loesser wrote "Luck Be a Lady" in 1950 for the mega-hit Tony Award winning musical, "Guys and Dolls." The film version five years later saw Marlon Brando sing the song. It is best known for becoming a standard in the repertoire of Frank Sinatra, perhaps the best-known Vegas crooner. The song is a wish that one's efforts in the casino would pay off big. In Vegas, both fate is often cruel and dreams are often shattered, but the show focused on those fulfilled, with one final huge payoff turning Vegas into a city of dreams come true. For this week only, you can save on the DVD that contains this complete Pacific Crest performance, along with all of the 13th through 22nd placing corps at the 2007 DCI World Championships. Buy the 2007 Division I Volume II World Championship DVD. (Available this week only for 20% off. Regular price: $29.95.) Discount DVD offer ends Monday, May 20 at 8:30 a.m. ET.